I started reading Chris d'Lacey's books late last years, and must admit I am addicted. I have read books from 4 different series and a few standalone books and have loved them all. I have also been reading them with my children and the ones we have shared the absolutely loved. 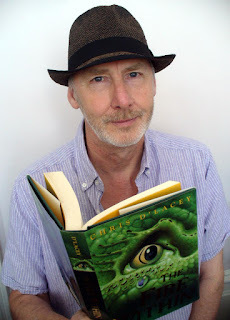 Chris is most famous for his three series about Dragons, The Dragons of Wayward Crescent, The Last Dragon Chronicles and the new Erth Dragons Series. But he has written books about racing pigeons, a boy with learning difficulties, a collectable bear, polar bears and many more. His stories are engaging and enthralling. Recently he took some time and answered 20 Questions for the readers here at Book Reviews and More. So here in his own words I present to you the wordsmith Chris d'Lacey. I didn't so much 'know', it simply became more apparent over time. I've been creative since the age of 17 when I first picked up a guitar and started composing songs. If I had a dream back then, it would have been to lead a rock band. Stories were something alien to me. We'd never studied creative writing at school, so I had no experience of it as an art form. I literally began on a whim one day at the age of 32. I wanted to do something romantic for my wife, Jay, and had the idea of writing a story for her about a toy polar bear she loved. Realising I knew very little about polar bears, I borrowed a book from my local library and started to read about them. That generated some ideas and away I went. Writing just got into my system after that. I experimented with short stories mainly and had a few published in literary magazines. I also did well in a few competitions. But I didn't attempt a children's story (a proper one at any rate) until I was 39. That became my first illustrated chapter book (A Hole at the Pole - more polar bears!) and overnight I found my 'voice'. I'd never been quite happy writing adult fiction, and people often said if I turned my stories round and saw them through a child's eyes I'd be a children's author. That turned out to be very true. Jay was my initial support, and still is. I always find it strange when fellow authors tell me their spouses aren't interested in what they do; I'd be lost without Jay (see question 4). Shortly after beginning to write, I joined a writers' club. I met people there with vast knowledge of the industry, many of whom were published, in all sorts of different genres. It was them who encouraged me to experiment. I'm a big fan of writers' clubs. An agent once dismissed them as 'mutual pat on the back societies' and tried to warn me away. But any writer will tell you that writers need writers. I love the club. I'm still a member thirty years later. Once I'd got my foot in the publishing door, agents and editors became very important. I've had four agents - not entirely by design. I didn't hit it off with the first one. We parted company because she refused to send out manuscripts that I believed in but she didn't. Shortly after leaving her I not only sold one of those manuscripts, but also wrote what is arguably my most successful book, Fly Cherokee Fly. With agents, it's terribly important to forge a good working relationship. Most authors describe their agent as their 'best friend'. I wouldn't go quite that far, but you do need someone who 'gets' you and is prepared to fight your corner. It's the same with editors. They are extremely hard-working people, often dealing with forty or fifty books a year. But if you find the right one they can be truly inspirational. They see weak spots in stories that the author doesn't, and will often suggest ideas or improvements. I couldn't name names in the UK, because I've had so many different editors; there were four, for instance, over the course of The Last Dragon Chronicles. But in the US I've had one, Lisa Sandell at Scholastic. She has been a rock and a great friend. And of course we mustn't forget all the librarians, teachers, booksellers, reviewers, bloggers and fans that help to build an author's profile. Every writer needs their champions. Sometimes, the books just strike a chord with people - yourself, for instance - who give their support though articles or events or plain word of mouth. That is wonderful and humbling all in one go. I worked for nearly thirty years at Leicester University, running various microscope facilities. I would still be doing that, I guess. The writing began about eight years into my time there and gradually snowballed. It got to a crazy point where I was receiving so many event requests that I had to use all my vacation days to fulfil them. I even negotiated some unpaid leave during my last two years of regular employment. I had a very understanding boss (and Vice Chancellor). In the end, I just couldn't run the two careers anymore and left the university when a suitable opportunity arose. I enjoyed my time being a scientist (of sorts) and was thrilled when the university gave me an honorary doctorate for my services to children's fiction. 4. What does your writing process look like? Takes us through the steps from idea to publishing? Perhaps the best way to illustrate this is to describe what happened after The Last Dragon Chronicles were done. The seven books of the Chronicles took approximately ten years to write and were all-consuming. Many good ideas had to be shelved to make way for them. By the end of that period I'd become typecast as a fantasy author and my publishers, not surprisingly, wanted me to stay in broadly the same area with whatever I did next. I took a year off while we were moving house and used the break to bounce a few ideas around with Jay. We eventually whittled them down to two. I had always wanted to write a kind of X-Files for kids, and that became the basis for The UNICORNE Files. Jay, however, was strongly in favour of developing her concept of an anthropomorphic dragon saga. You'll have gathered from this that Jay is crucial to the whole development process. Indeed, whatever comes out of this house is very much a joint enterprise. Sometimes the ideas come from Jay, sometimes from me, but we both contribute to the eventual storylines. She was keen to push the Erth Dragons because so many children had sent us stories in which their dragons talked. So, because we had a little time on our hands, we plotted out a basic storyline for Erth Dragons #1, The Wearle and did the same with A Dark Inheritance, book one of the UFiles. I then went away and wrote an opening for each. I write every single word of the books, but will rewrite them chapter by chapter until Jay's happy. She is my frontline editor as well as ideas generator and more besides. Nothing out of character ever gets past her! We then sent the partial manuscripts to our agent, Ed Wilson. He was excited by both and submitted them to my US and UK publishers. To my surprise, both publishers went for the UFiles idea. Jay was stunned, because we both thought The Wearle was about the best thing we'd ever produced. Still, we were thrilled to have the UFiles in both territories, especially as the books would be published primarily in North America and also edited there. The series was commissioned and I set about writing them. Shortly afterwards, my main UK publisher suddenly decided they wanted Erth Dragons. So we set up a deal for those books as well and spent the next few years dovetailing the two series. It was quite an intense period, but I think I produced some of my best writing during it. The UFiles trilogy is now complete and all three books are available through the normal sources. The first two books of the Erth Dragons are also complete. The Wearle will be available in North America in December 2016. All the stories went through the normal editorial processes (mainly by email and sometimes by telephone to the States). With the UFiles, I found myself in the bizarre situation of writing a book in my native English, having it edited and Americanised in NYC, then having it re-Anglicised when the finished manuscript was returned to my UK publisher! I lost count of the number of times Jay and I read drafts or checked copyedits. There was a lot of debate about the covers (there usually is), but the author has to rely on the judgement of the publisher's design and marketing team to get this right, and everyone was happy in the end. One of the most interesting aspects of the Erth Dragons manuscripts was the creation of a character list and a glossary, both of which Jay collated. I've also had requests from fans to put maps inside the books. Maybe - when my drawing improves! I can't listen to anything when I'm writing. I prefer absolute silence. I know one author who puts on a pair of headphones and listens to loud heavy metal while he's working. It's his way of 'zoning out', I think. 6. What authors influenced your writing style and format? None. Not consciously at any rate. I say this because I didn't come to writing from a literary standpoint. I never had any ambitions to be a writer, I just sidestepped into it from songwriting. I'm probably the worst read writer you will ever meet. Seriously. I like reading books, but I never seem to have the time for them. When I joined the writers' group, a friend introduced me to the short stories of Raymond Carver. Carver's punchy style had a big impact on me for a while. My text became more colourful when I got into the fantasy arena. In one sense, every book I've ever read and liked has influenced me in some way, because every different style suggests a potentially new direction that might be worth attempting. 7. What of your books is your favorite and why? This is always such a difficult question to answer because barring a couple I like them all, for different reasons. Lately, I'm very fond of The Wearle and A Crown of Dragons. The Wearle was a huge challenge; it's not easy putting yourself in the head of a dragon and creating a society around them. A Crown of Dragons grew on me as I wrote it. It's the least dynamic story of the UFiles but I like the mix of problems Michael faces, both domestic and supernatural. (Interesting note: it's the only book an editor has approved without wanting changes.) I often say that my favourite book of the Chronicles is Fire World, because it's just so different from anything else I've done. It was a bold move to enter a parallel universe six books into a major series! But if you really want to pin me down to one choice I have to plump for The Fire Within, because it's not really a book about clay dragons (or squirrels) it's a book about creativity and where ideas come from. I get quite emotional just thinking about that book. 8. One of the greatest strengths in your books are the characters, they are so well written. The characters you create, are they reflections of people you know, composites of different people you know or entirely your creations? I've never deliberately based a character on anyone I know, other than David Rain - who was based loosely on me. I was interviewed by a pigeon fancier once who was remarkably like Alf Duckins in Cherokee - but I met him after the book was written. The closest was probably Zanna, David's partner in the Chronicles. I met a girl at a signing who had the complete goth look: the dark hair, pale face, purple eye shadow etc. She also had attitude! At the time, I wanted a girlfriend for David who would be the complete opposite of his first partner, Sophie. After meeting the goth girl, Zanna just clicked into place. I've always liked feisty heroines. I suppose all writers absorb the mannerisms and personalities of the people they meet and feed them back into their characters by a kind of intuitive osmosis. I just aim to put the right character in the right place at the right time. Mums are my favourites. I think I'm good at mums. 9. Which of the dragons you have created is your favorite and why? That would have to be Gadzooks, because of what he represents. He's more than just a writing dragon, he's the physical embodiment of David's thought processes. I've always been fascinated by the nature of inspiration: How does it happen? Where does it come from? What triggers it? Gadzooks puts a shape to it; that's why I love him. I think about them all the time, especially the Pennykettle dragons. I almost feel they're around me - and many of them are; I have the sculptures - who knows what they get up to…? I occasionally find myself thinking about a character's plight - like Michael Malone's in The UNICORNE Files. He eventually, literally, puts his world to rights - but is he happy? Jay says that when you create a character you give them a life somewhere in the universe and that's why they feel so real, like kin. This is most apparent for me when I'm answering fan mail. A student wrote in just the other day saying how much like her mother Liz Pennykettle was. It's very satisfying, in that small sense, to know that Liz 'exists' somewhere. 11. Some of your books are currently out of print, for example Pawnee Warrior the continuation of Fly, Cherokee Fly, do you have plans to rerelease them as ebooks? Well, that would be down to the publisher, not me. But even if I was to acquire the rights to books like Pawnee Warrior again, I'd have to ask myself whether it would be worth putting them out there. I fear the zeitgeist just wouldn't be the same. 12. Speaking of eBooks. Some of your books are available in electronic formats but with that comes bootleg distribution. What are your impressions of ebooks and the distribution of them through torrents and other illegal means? I have no problems with eBooks. If it suits someone to read my stories on a digital device then so be it. Like most authors, I prefer the feel of tree books and I'm always pleased to see general increases in book store sales. I have no experience of torrents and I'm not even sure what they are - I assume online sites where people can download books for free? If that's so, I wouldn't be terribly happy about having my work pirated, but I can't imagine there would be a huge demand for my back catalogue anyway! Again, no experience of this. I would look to my publishers first and foremost and expect them to deal with it. 14. You have mentioned that The Dragons of Wayward Crescent was planned to be 12 books. You have also said you might get back to it. Could you share the names you had planned for the other 8 Dragon's? 15. What were some of your favorite books and authors when you were younger? I didn't read an awful lot when I was young - apart from comics. I lapped up all the DC and Marvel stuff. I liked The Fantastic Four best of all, which is why I gave them a nod in Alexander's Army. I'm pretty sure it was those sorts of comics that fuelled the darker side of my writing. I was mid-teens before I really got into books. I liked Paddington Bear when I was very young, but Dahl somehow passed me by (though I love his books now). My favourite series was about the adventures of a boy called Jennings, who attended boarding school and was always getting into different 'scrapes'. Imagine Harry Potter without the magic, set about seventy years ago in middle class England, and you've got it. The books were funny and very popular over here, though I can't imagine they had any kind of presence in North America. When I did start reading in earnest, I stuck mainly to science fiction and fantasy. My favourites were anything by Tolkien, the Gormenghast books of Mervyn Peake, and all the popular SF writers: Bradbury, Heinlein, Arthur C. Clarke, and especially Asimov's robot stories. I couldn't get enough of them. The two British writers I like and admire are David Almond, who has a beautifully sparse style (he's also a Carver fan). Read Skellig. It's creepy and stunning and stays in the memory for a long, long time. I also like Philip Reeve, who is incredibly inventive and has the most wonderful vocabulary. I highly recommend his Mortal Engines series. The one book I wish I'd written is Holes by Louis Sachar. That was just amazing. And so was Patrick Ness's Chaos Walking trilogy. A few years ago, on my second book tour of the US, I met Jennifer Nielsen and took home a copy of The False Prince. I thought that was great. You'll have gathered from this that I don't read many adult books. Occasionally Jay will plonk one down in front of me and say, "You'll like that", which is how I came to read Wool by Hugh Howey. That had me gripped. And I'll give a plug here to my long-time friend, Rod Duncan, who gets the vote for the best title: The Bullet Catcher's Daughter. If you're a steampunk fan, you don't want to miss that. 17. 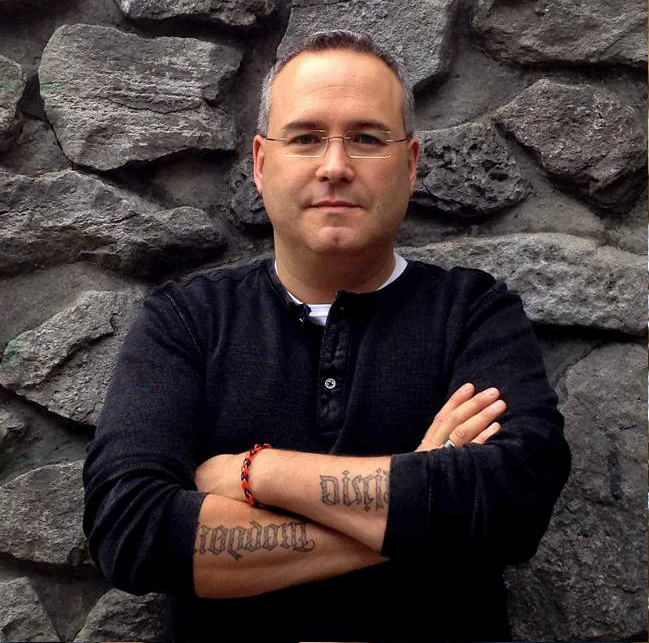 How many books are planned for the Erth Dragons series? Initially, I was commissioned to write just two books: The Wearle and Dark Wyng. But my editor is a big dragon fan and she is keen for me to produce more. She's already talking of a spin off series about what happens when the two young Erth dragons, Gayl and Gariffred, grow up. For now, there will be at least three of the current series. We'll see how everyone feels after that. The publication of The Wearle in North America shortly after Christmas will be a landmark point. If people over there go crazy for the series as they did for the Chronicles then anything is possible. I think much will depend on whether readers can accept the anthropomorphism. The dragons in these books are intelligent and powerful - but nowhere near as cunning as the humans they run into. That, for me, is the real counterpoint of the books: how much each species impacts upon the other, and what effects each has on the other's culture. 18. Do you ever picture your dragons outside of your stories? What is Gruffen or Grabber up to these days? As I said above, I'm always kind of aware of the dragons but I don't project them forwards. I think characters are of their time. Having said that, I daren't think too long about a question like this because I know it will generate ideas that I can't afford to give writing time to. I think I'll leave that to the fan fiction websites! The Last Dragon Chronicles (because it's really just one story chopped up into seven parts). Read more than I did! Reading not only stimulates the imagination it helps you understand how stories are structured and paced. Don't be afraid to try something different. Look at The Knife of Never Letting Go or Railhead and you'll know what I mean. Try to write a little every day (most novelists have a strict regime and will aim to hit a certain word count in one session). Children ask me endlessly if they can write about my characters. I usually reply, "Why would you want to? It's ultimately more satisfying to invent your own." When you've finished a piece, go back and edit it. I probably spend an hour rewriting the previous day's piece before I go on to create something new. And finally, always believe in yourself. If you genuinely - I mean genuinely - believe a story is good, there's every chance someone else will too. Thank you Chris. As you can see Chris has a great passion for his craft and is great at it. His writing is in many ways reminiscent of Madeleine L'Engle's, His books are wonderful stories for the young, and young at heart. I love reading his books, and reading them with my children and I am sure you will be touched by them as well.